Set on the remote edge of Western Australia after the Great War, The Light Between Oceans tells the story of Tom Sherbourne, a shell-shocked veteran who becomes the lighthouse keeper on the otherwise uninhabited Janus Island. Struggling with survivor's guilt, Tom falls in love and marries vivacious Isabel Graysmark, herself grieving two brothers lost in the war. They hope to start a new family on the island. However, they only encounter more tragedy and loss. When a rowboat holding a dead man and an infant girl washes ashore, Isabel believes that fate has delivered her the child she so desperately desires - a belief that will have devastating consequences for all involved. Derek Cianfrance knows all about tortured relationships. This is, after all, the director that brought us Blue Valentine and The Place Beyond The Pines. It is perhaps unsurprising, therefore, that he was attracted to M.L. Stedman’s novel, The Light Between Oceans. The Light Between Oceans aims to be an old fashioned sweeping weepy. It follows Tom and Isabel from the light at the start of their relationship to the darkness after they have made their devastating choice. Michael Fassbender and Alicia Vikander are, of course, more than able to portray these emotional highs and lows. Both give superb, committed performances. The camera often watches them at close hand, observing every painful, torturous moment. 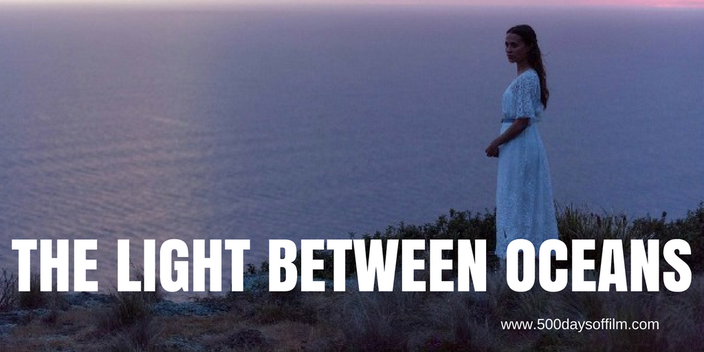 While Cianfrance’s Blue Valentine (starring Michelle Williams and Ryan Gosling) is visually inventive and emotionally devastating, The Light Between Oceans feels rather pedestrian by comparison. The story is full of drama and tragedy and yet, bar a couple of scenes, I remained at an emotional distance throughout. As a result, despite the film's powerful performances and Adam Arkapaw’s stunning cinematography, I wasn't moved in the way I had expected and left the cinema feeling rather bleak and unsatisfied. The Light Between Oceans is Derek Cianfrance’s first adaptation of a novel. He wrote the film’s screenplay without guidance from Stedman but has noted that the author was omnipresent in his head: “Even though we never talked, I had such a deep relationship with her in my mind. I treated her words as scripture. I read the book so many times, I had it memorized,” he explains. Cianfrance cast Vikander in the role of Isabel after seeing her performance in A Royal Affair. If you haven’t seen this film, I would really recommend it. Have you seen The Light Between Oceans? If you have, what did you think about this movie? Let me know in the box below! Finally got round to watching this Jane after loving the book. As is often the case I did much prefer the book. Whilst I enjoyed the film and would still highly recommend it, I didn't find it as moving or emotional as the book. I also think the film should have played bit more on the friendship between the keeper and the 2 guys who used to do the journey to and from the lighthouse (can't remember their names) and the betrayal of the younger one of the two. Still a good film and glad I watched it.